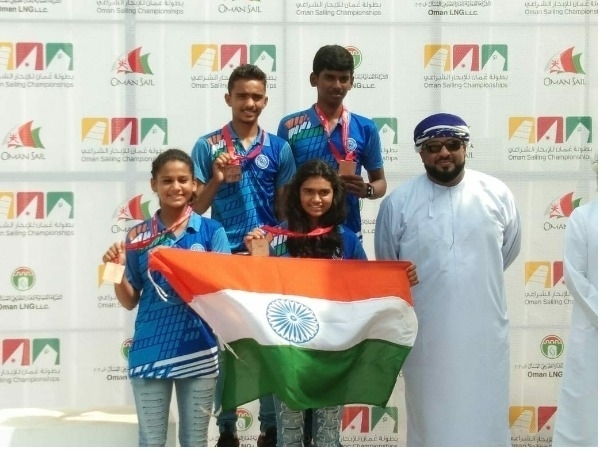 Muscat, August 10: The young Indian contingent has put up an impressive show of their talent in the Oman Sailing Championship 2018 and bagged as many as five medals. Five of the six contestants made the country proud and returned home with medals including three golds, a silver and a bronze. Ritika Dangi was the first to win the gold in the Optimist class while Uma Chauhan got the bronze in the same race. On the other side, in the Optimist class boys’ race, Ashish Vishwakarma and Neel Anand bagged the gold and silver medal respectively. In the Laser 4.7 class, Satish Yadav bagged the gold medal. Acknowledging the outstanding performance of the young Indian sailors in the Oman Sailing Championship 2018, YAI said that these 13- to 16-year-old sailors are the future Olympic medal hopes for the country. While the president of the YAI also congratulated the medal winners for bringing glory to the nation. The four players including Ritika Dangi, Uma Chauhan and Satish Yadav belong to Madhya Pradesh. Appreciating the spectacular performance of the players in the championship, the State Sports Minister Yashodhara Raje Scindia congratulated the medal winners and appreciated their efforts. She said that the State players have made the country and state proud by winning medals at an international platform. The week-long competition was held from August 2 to August 8 and saw 130 sailors between the ages of 10 and 17 compete in various races at the Sur Sailing School.